Mike called me this morning at work to tell me that the decision had been made, and Maddie was going to be transferred to the Westwood hospital and that her lung procedure was going to be today. He said he was told that it would happen in a few hours, so I didn’t have to rush, but I should get there soon. I quickly wrapped up my loose ends at work, made arrangements for my co-workers to help me with clients, and left for the hospital. A parent has to ride with Maddie during the transfer and I called dibs on all ambulance rides. I want the siren. 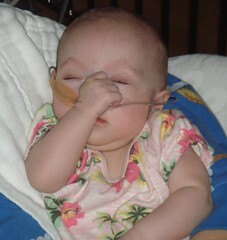 When I arrived at the hospital, my parents were in Maddie’s room. Mike had been in her room for over 48 hours straight so he needed to go home and hose himself off. My mom and I gathered up Maddie’s things, and then we settled down to wait for the transfer. The Westwood hospital called Maddie’s room to finalize details with me, and they said that the transfer was going to happen in a few hours. Sweet, still on track. I emailed all of my nurse friends at the other hospital to let them know we were coming. We were ready. Then Maddie’s nurse came in and told us no beds had opened in Westwood, so the transfer wasn’t going through today. I told the nurse that the Westwood hospital had called and said that everything was still on track. She was confused and said she would figure out what the deal was, since we were being told different things. When she was gone, Maddie and I sat there and put hexes on the stupid hospital administration. Why tell us she’s getting transferred when there is a possibility she might not be? Predictably, Maddie’s nurse came back and said that the transfer definitely wasn’t happening today, but that it was on for tomorrow. When I asked what was to prevent the same thing from happening tomorrow, she said, “nothing.” GOODY. Why do I have a feeling she won’t get transferred until next week? My boss is going to love all the work I’m going to miss. I don’t think I’ve explained WHY she needs to be transferred, mostly because it was really just explained to me – and not very well, as you will soon see. Maddie is in the UCLA medical system. Since she was in the NICU at the main teaching hospital in Westwood, Mike and I decided that for all her future care we would stay within the system. That way her medical history would be easily accessible for anyone who treats her. Of course, that means they actually have to LOOK AT IT instead of asking me for the 800th time if she has been tested for cystic fibrosis, but at least the tools are there. Mike and I were under the impression that all doctors in the UCLA system had privileges at the Westwood AND Santa Monica hospitals. Apparently this is not the case. It seems silly to me since the two hospitals are 3.8 miles apart. The pediatric pulmonologist (who I am going to start calling Dr. Lung because typing “pulmonologist” makes me tired) only has privileges at the Westwood campus. She is there, so Maddie must go there. I am glad Maddie’s pediatrician (looooooove) has privileges at both hospitals. I am not glad we are going to the hospital in Westwood, despite our familiarity with the place and the friends we have there. It is old and the parking there blows, and it is a whole 0.2 miles further from our house. At least the cafeteria is better. Maddie most likely won’t have her own room, which means only one person can sleep over at night. That is going to be hard. I’m keeping my fingers crossed that she gets a rare private room, but I’m not holding my breath. The Westwood hospital is also MUCH more intense – the whole pediatric floor is like an intensive care unit. It’s likely that her roommate will be a VERY ill child. I’m kind of dreading that. I’ve had my fill of sick kiddos. Tomorrow morning is the March for Babies. We’re bummed that Maddie (and my mom, who is staying with her) won’t be there, but her repeat hospitalizations have strengthened our resolve to volunteer with the March of Dimes. All these problems have been caused by her prematurity. Hopefully we can help another baby avoid all of this madness!!! you just made me cry. I love you guys. Despite your baby being in the hospital you are still going to the march. you rock. 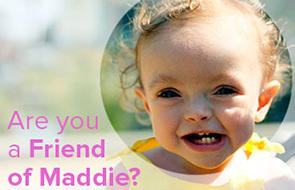 hope this soon gets resolved and maddie will be on her way to feelign better, breatihng better and being home in the beautiful california weather with you guys. thinking of you- please keep me posted. Bureaucracy stinks. Right hand, meet left hand. Work together now. ugh. I hope the march went well today. I hope Maddie had a better day. More good thoughts flying across our nation to you.